A political dissident since age 16, Daniel Ortega Saavedra spent time in a Managua prison. Upon his release, he fled to Cuba and established relationships which would be vital for the Sandinista movement. When the Sandinistas ousted the Somoza regime, Ortega maneuvered himself into the de facto presidency. Ortega’s close ties to the Castro regime in turn prompted US support for the Contra rebels. Operating out of Northern Nicaragua and drawing support from agricultural interests that had been collectivized, the Contras were to prove a major hurdle to the success of Sandinista governance. Ultimately, economic stagnation would prove the undoing of Ortega’s government. An unattractive event, since the influence is removed from a rather unimportant country, and your choices for the coup are the three most stable countries in the region (and you don’t even get Mil Ops for it). Maybe you can headline it and coup Cuba to drop DEFCON in the headline or protect Cuba from realignments. And it’s kind of funny to wipe out a lot of US influence from Nicaragua if they over-couped it and had it at 6/0 or something. But I haven’t ever seen it played for the event by the USSR. Everyone knows about Lone Gunman, but Ortega is the hipster’s DEFCON suicide card. 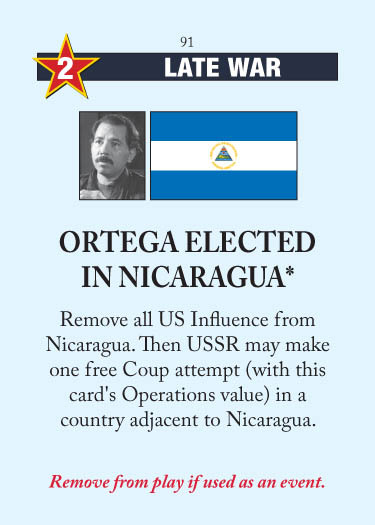 If you have any influence in Cuba, then Ortega is unplayable at DEFCON 2. If you don’t have influence in Cuba, then Ortega is not much of a concern. The USSR usually gets a coup against 3-stability Costa Rica with a 2 Ops card, Nicaragua gets emptied, and I can just play back into Nicaragua if I really care about it (which I probably don’t). This entry was posted in Late War, USSR Events and tagged ortega elected in nicaragua. Bookmark the permalink. Once a rather strange cue of coincidences occurred. As the USSR I headlined Brezhnev Doctrine and since DEFCON was still 3 I played Missile Envy in my first AR, I received Latin American Death Squads (which was surprising itself). US couped a BG in his first AR with Missile Envy. Since Nicaragua was 4*/0 I thought now it’s worth the gamble, since the base value to coup Costa Rica was 4 now. I rolled a ‘5’ and succeeded to throw him out completely. Since Panama was also Russian a quite successful use of Ortega (although the US was full of low OP cards anyway), but I must admit that I’ve seen this only once in more than 200 games.